Kalamazoo County Consolidated Dispatch Authority (KCCDA), Kalamazoo County Sheriff’s Office, Kalamazoo Department of Public Safety, Kalamazoo Township Police Department, and Portage Public Safety announces the GO-LIVE of Text-to-9-1-1! Text-to-9-1-1 service allows residents and visitors to send a text message to 9-1-1 from their mobile devices if they are within Kalamazoo County. KCCDA began the coordinated effort to deploy the service in August of last year. The 9-1-1 centers have been testing the four major wireless carriers since early December; with the last successfully tested on January 25th. While this new service is available, public safety officials county-wide want to remind everyone that calling 9-1-1 remains the most time effective method to access emergency personnel. We encourage you to Call if you can; Text if you can’t! 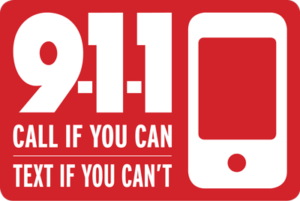 Text to 9-1-1 service is not available everywhere in Michigan nor the U.S. If you attempt to send a Text-to-911 and the service is not available, you will receive an auto-reply message advising the service is not available and to make a voice call. Questions about the content of this release can be directed to KCCDA Executive Director Jeff Troyer at (269) 718-2195.